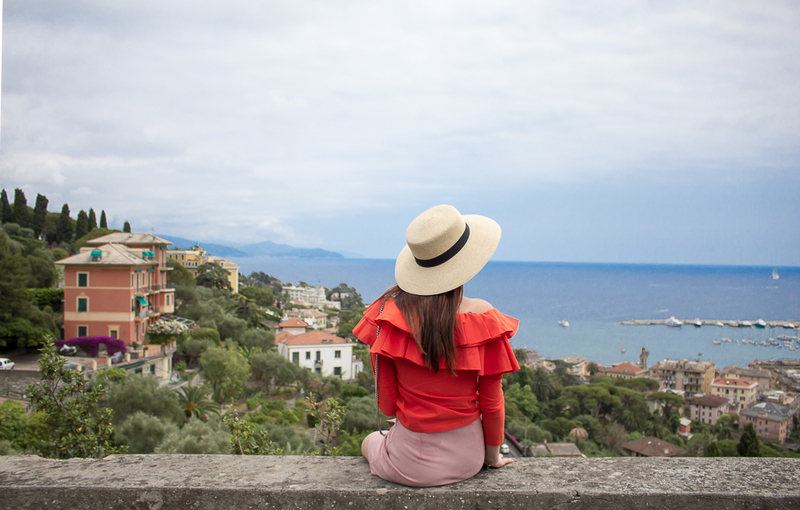 I have not been super active on my blog recently (I have been on my Instagram though), but I am coming with the whole loads of pictures from our latest road trip in Italy, and tones of new projects! I am really impressed by the video the luxury cosmetic brand SKII has just created. SKII sells luxury skin care products, and is owned by Procter & Gamble. The brand tends to be rather considerate of their clients, hence the idea of the newest video showing how three different women, from three different countries #changedestiny by tackling age-related pressure. Only 2 out of 10 women feel comfortable with the idea of getting older according to a new study by SK-II ( in Asian countries). The reasons are many – mainly pressure from family and friends, society’s scrutiny or feeling the burden to marry before an artificially created deadline is up. Although the survey relates to Asia, I think this sort of issue might bother quite a lot of ladies of all ages. Don’t let anyone to tell you how to live – unless you want opinions, which is completely understandable. Set your own goals and try to achieve them – my favorite quote is ‘don’t let your dreams be dreams’! Try to reach them no matter what! …the reality is YOU and how you want to live. 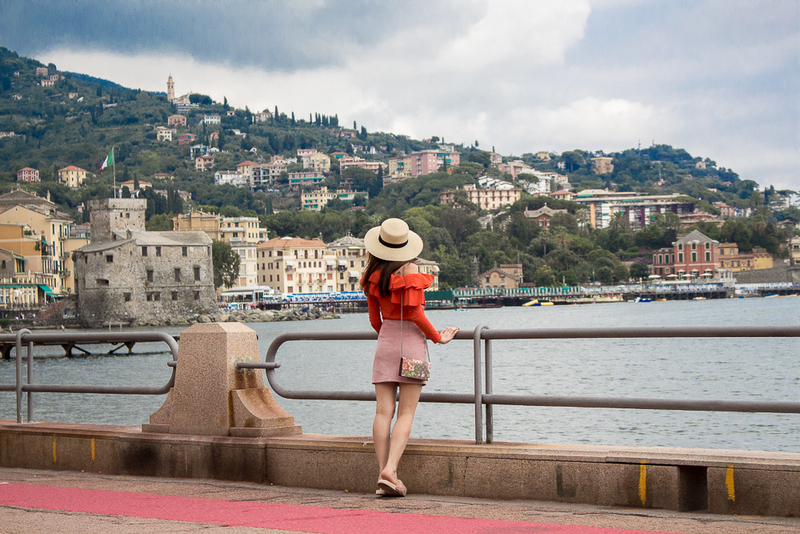 The photos were taken in Rapallo – a city in between Portofino and Cinque Terre, located in Italian Liguria. We were quite amused by the views from up the hill, where it is possible to get with a car. Once you are there, you won’t want to leave! 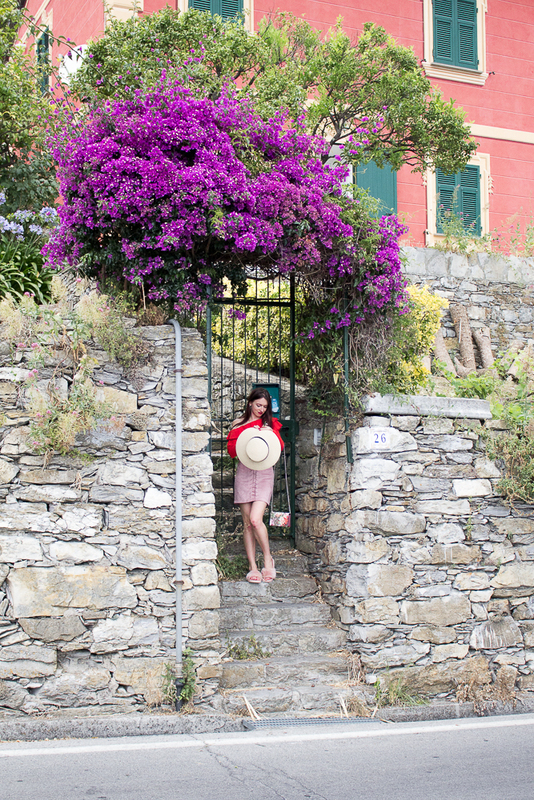 The orange, red and yellow houses are probably a signature picture of Liguria. 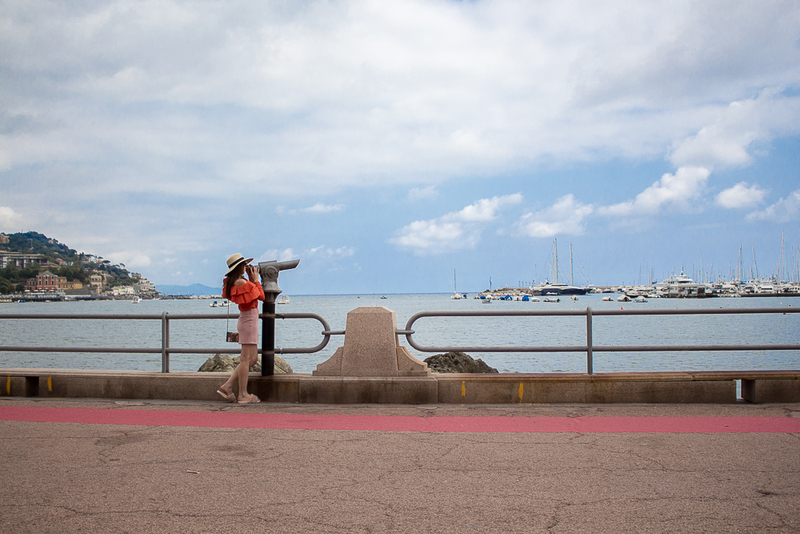 Rapallo, unlike Portofino, has more of an approachable ‘appearance’, and is very tourist-friendly. You can buy a tasty wine or a delicious Aperol Spritz in the food truck located directly on the promenade and sip it overlooking the Mediterranean sea and magnificent billion-dollar yachts. I would recommend to take a walk along the coastline, step to the city and walk up the hill in order to fully enjoy this place. Don’t forget to get an espresso followed by extra dark hot chocolate gelato. What do you think of a combination of baby pink and red? It’s one of the hottest trends of the S/S17. I was not quite convinced, but then I like this sort of unusual mix. I think the red top would also go with the baby pink culottes. when i first saw the back of your outfit I was like oh that is cute! and then I saw the front and those shoes and I’m like oh my god! obsessed! I love the SKII brand and iI love what this campaign stands for. Sends a great message! What a beautiful location and gorgeous pictures! I love this color combo! The look is so chic! I love the color of this top. Thanks for sharing your opinion and I am a big fan of SKII. I love your outfits and let me tell you . I am so jeoulous of you, the place looks like heaven. Would you like to follow each other on bloglovin’? Follow me and I’ll follow you back. Incredible photos and such a love post! What an interesting idea/ project youre working on dear! Your red tiered ruffled top is the cutest! Love the photos too. Ohhhh your pictures are SO pretty ! Love your ruffle top !